The Chinese Porcelain Bowl by Vapor Hookahs is a gorgeous glazed, traditional Egyptian style bowl that is available in a variety of colors to match any hookah design. 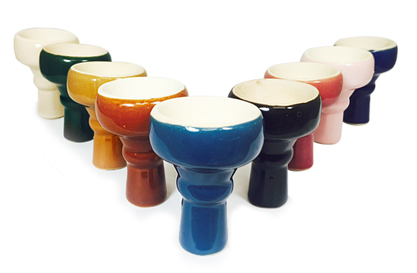 The style is reminiscent of traditional hookah bowls, yet the finish is very modern and sleek. The porcelain material is sturdy and easy to clean and maintain. This bowl will fit over most hookah stem when used with an Egyptian Rubber Bowl Grommet. The Chinese Porcelain Bowl retains heat very well and will allow you to have a perfect hookah session with your favorite shisha. The Chinese Porcelain Hookah Bowl can hold approximately 15 to 20 grams of Flavored Tobacco.